Rewarded as runners-up at the 1962 World Championships, the Galt Terriers – representing Canada – were presented with these attractive silver medals, with this example hailing from the personal collection of NHL superstar and Terrier Tod Sloan. 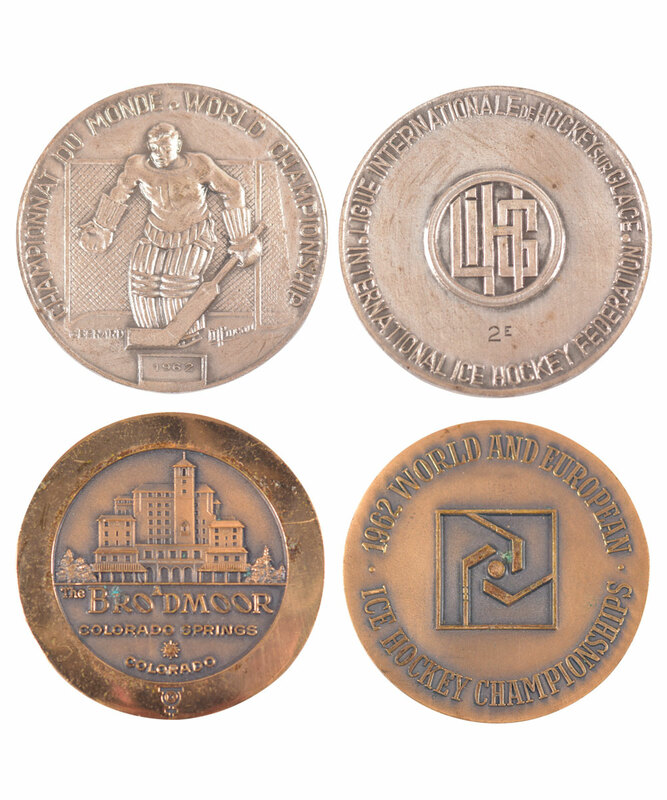 At 2 3/8” and encompassed by “Championnat du Monde – World Championship” with a generic netmider in relief along with the date below (1962), the reverse features a French monogram of the IIHF logo, along with “2e” stamped below. Accompanying the medal and also from Sloan’s personal collection, we have a 1962 “World and European Ice Hockey Championships” participation medal, 5 related hockey pins including examples for the Dutch and Japanese National Teams, a pair of Tod’s initialed cuff links (MAS) and an additional 7 military pins along with a small ashtray. An LOA from the Sloan family will accompany. The 1962 silver medal exhibits light wear with no issues, while the 1962 participation medal exhibits handling wear and surface loss over the reverse. The remaining pins and cuff links all show moderate to heavy wear, commensurate with both age and their former use.